Q: As a member on the board of several leading companies and having first-hand view of industry, do you think Goa can be the future destination for business? I think Goa is a place to do business but not any just any kind of business. It has to be business that is consistent with the verdant landscape of the state. We cannot do anything that is environmentally polluting because we have to keep up the image of green Goa. We are in the century of knowledge presently and knowledge industry will be the key for growth. Industry such as animation that requires digital power as well as mental creativity is suitable here. My dream is Goa where one can meet, imagine and create. Today the richest company in the world is Apple and not Exxon or Mobil. The top five global companies are in technology and mental space and not into physical commodities. I see no reason why they cannot be right for Goa, because the state has the right atmosphere for creating products of the mind. It has tranquility which is conducive to imagine products. I am surprised to learn of Goan startups doing fantastic world. What they have to do is raise ambition and be exponential. The definition of industry is changing. We have to adapt and in Goa also we have to change and look into the future. Q: How do you view the changes taking place in the state during each periodic visit? There is no question that Goa is changed for the better. Absolutely no question! I had once said and continue to say it again, let's not compare Goa with India. In fact we are ahead of India in many respects. I am seeing a continuous progress. While India is aiming to becoming a developed nation, Goa must aim to develop ahead of other states. Q: You presented the state with a Goa 2035 Vision Strategy. How much of that vision is reality and not dream? The vision document was not just a dream because my feet are always on the ground. My eyes on the sky but my feet are always on the ground. So I always give something which is pragmatic. And don't forget that the document had thought leaders behind it like Dr Vijay Kelkar who gave us GST 14 years ago and Vijay Bhat, Charles Correia, Madhav Gadgil, among others. So the report is kind of sum of their wisdom. It gives the road-map for the future. It talks about a number of things.We had said that there should be a NIT in Goa and now there is a NIT here. We had said there should be an IIT and there is an IIT presently. So many things that we talked about are gradually happening. They can't happen immediately. We also said there should be an Indian Institute of Management, a central university. The rate of progress depends also on government policy, on people's prepredness and on society's willingness. It cannot be pushed against the will of the people. Q: What is your view on the present education system? As far as the present education system is concerned it is mainly based on learning-by-rote. We have to move to learning-by-doing and from there to learning by creating and finally to learning by co-creating with machines. Basically education has to be changed to match and the changes have to be fundamental. The digital world is changing things so rapidly that understanding the future needs of education is itself a big challenge. One of the challenges that India faced was in scaling technology. Now thanks to Digital India technology is available to everybody via the smart phone. The scaling problem is sorted out. The next problem is of teachers. Current teachers will have to be ahead of the students is my belief. Q: What do you think is the reason for engineers becoming jobless these days? This is happening because of the advent of robotics, artificial intelligence(AI) and advanced automation. Whatever used to be done by brawn is being done by robots and whatever used to be done by brain is being done by AI. Therefore we are now in technology led jobless growth. But somebody has to manufacture the robots, write the software, design the robots and maintain them. So the nature of engineering jobs is changing. One has to also realize that the manufacturing industry is changing. From assembly line production we are moving to 3-D processes. There are certain jobs there are obviously going to go because of technology, for e.g., in banks. Therefore the education system has to change to meet needs of industry. Q: In the midst of the digital age, what do you think of the quality of our workforce? For the young people today Google is becoming the guru. The other problem is their attention span and lack of focus. Education is about learning, doing and being. Of the three he most important part is being viz., being human and showing empathy. It cannot be learnt on the computer. So I think one will see a trend towards courses that teach the right social behavior. I was once interviewed on future engineers and I said that, engineers without empathy are no engineers. Basically there are three qualities in the workforce that will be important- innovation, passion and compassion. 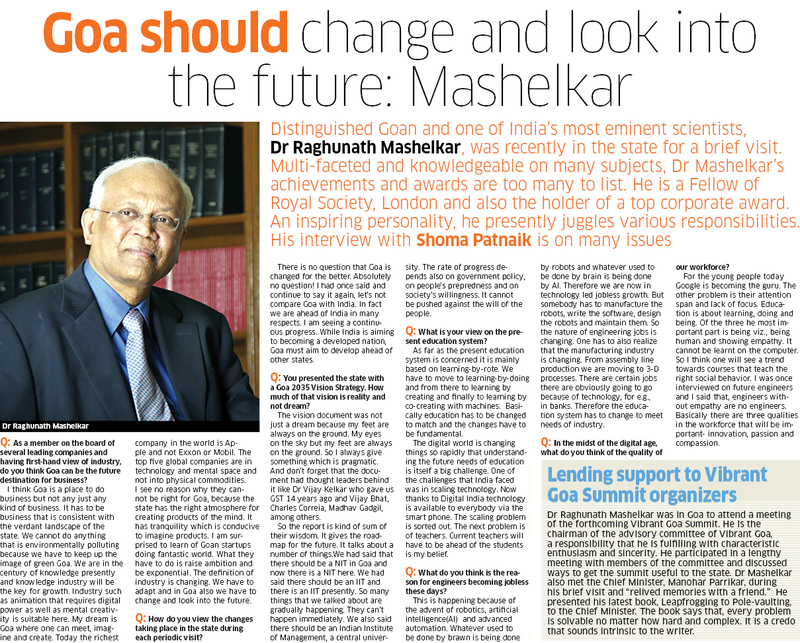 Dr Raghunath Mashelkar was in Goa to attend a meeting of the forthcoming Vibrant Goa Summit. He is the chairman of the advisory committee of Vibrant Goa, a responsibility that he is fulfilling with characteristic enthusiasm and sincerity. He participated in a lengthy meeting with members of the committee and discussed ways to get the summit useful to the state. Dr Mashelkar also met the Chief Minister, Manohar Parrikar, during his brief visit and "relived memories with a friend." He presented his latest book, Leapfrogging to Pole-vaulting, to the Chief Minister. The book says that, every problem is solvable no matter how hard and complex. It is a credo that sounds intrinsic to the writer.